I just created a petition entitled: “Office of the Commissioner of Baseball Allan H. Selig, Commissioner: “Make Pete Rose eligible for MLB Hall Of Fame Induction”, because I care deeply about this very important issue. I’m trying to collect 100 signatures, and I could really use your help. It’ll just take a minute! Once you’re done, please ask your friends to sign the petition as well. 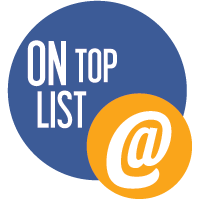 Grassroots movements succeed because people like you are willing to spread the word! 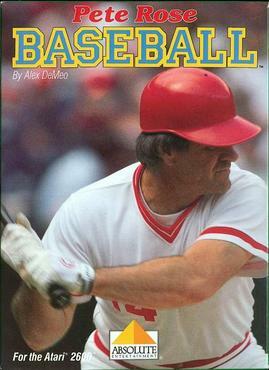 —————-Make Pete Rose eligible for MLB Hall Of Fame Induction. To give Pete Rose the opportunity to be in the Baseball Hall Of Fame which he deserves because of his prowess on the baseball field as one of the best players to have ever played professional baseball. Why This Is Important Pete Rose was one of the greatest players to ever play the game. He is 70 years old and deserves to have the opportunity for induction into the MLB Hall Of Fame while he is still living. It would tragic for this man not to receive what he deserves for exceptional play matched and by very few that are in the Hall Of Fame. Why Pete Rose should be inducted, career bio, records and career stats. Major League Baseball’s All Time Hits King. Most Career Hits 4,256 – Most Doubles 746 NL – 3 Times NL Batting Champ 1968-1969 -1973 – Most Extra Base Hits by Switch Hitter 1,041 – All Century Team 1900-2000 – 17 All star at 5 positions – 1963 ROY – 1973 NL MVP = 1975 WS MVP – Longest NL Consecutive Game Hitting Steak (44 Games) 1978 – 4 Hits or More in Games 73 Times – Most Extra Base Hits by Switch Hitter 1,041 – Only major league Player in History to Play 500 Games at 5 Positions – Most Total Times on base 5,929 – 5 hits or more in Games 10 Times. Plus many other reacords. Who goes to Hall in 2013? Question of the day: Who goes to Hall in 2013? Now that Barry Larkin has been elected to the Baseball Hall of Fame, many fans already are looking to the future in Cooperstown — and specifically the star-studded and star-crossed Class of 2013 candidates. Ballot newcomers will include Craig Biggio, Barry Bonds, Roger Clemens, Mike Piazza, Curt Schilling and Sammy Sosa. Holdovers will include Jack Morris (who received 66.7 percent of the required 75 percent this year), Jeff Bagwell (56.0), Lee Smith (50.6) and Tim Raines (48.7). Returning members of the 500-home-run club include Mark McGwire (19.5) and Rafael Palmeiro (12.6). In the cyclical realm of the annual National Baseball Hall of Fame ballot, there are years with only a few viable candidates, such as the 2012 election to be announced Monday, and others with several real possibilities. And there’s always a dash of bubbling conversation over who should get in and who shouldn’t. Then there is the 2013 ballot, which promises to be a whole different ballgame. A year before it will even be in the hands of Baseball Writers’ Association of America members who compose the electorate for induction, it’s clear the 2013 ballot is one that will change the landscape of how players are elected to join the greats at Cooperstown. In terms of epic production, celebrated accomplishments and, most telling, their stardom taking place at the epicenter of an era tainted by performance-enhancing drugs in baseball, this class is without peer. 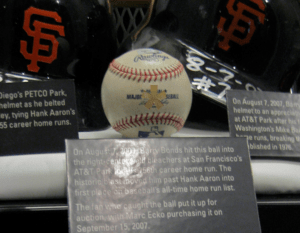 Barry Bonds’ 756th home run ball in the Baseball Hall of Fame, with the asterisk branded on. This year, the announcement, which will be delivered Monday on MLB Network and streamed live on MLB.com starting at 2 p.m. ET, could be that Barry Larkin or perhaps even Jack Morris received enough of a bump of support to earn induction into the Hall of Fame. Or, it could be that no one earned enough votes from the BBWAA electorate, delivering a Hall of Fame shutout for the first time since 1996. Next year’s announcement is bound to have a more profound effect on the game, regardless. It will amount to a pronouncement on an era of unparalleled accomplishments and widespread suspicions. For the first time, the Hall of Fame-lock accomplishments of Barry Bonds, a record seven-time Most Valuable Player, and Roger Clemens, a record seven-time Cy Young Award winner, will be put to the Cooperstown test. It’s obviously not as simple as those daunting resume items: Those accomplishments must be balanced against, among other things, each former superstar’s current legal battles with the United States government. In separate cases at trial, they have been accused of lying when saying under oath that they never used performance-enhancing drugs. And Bonds and Clemens are just the tip of the 2013 ballot’s iceberg. There’s also Sammy Sosa, Mike Piazza, Craig Biggio and Curt Schilling — all among the most accomplished players of their era. Others such as Kenny Lofton, David Wells and Julio Franco deepen the ballot further, making it much heftier than the 2012 ballot’s roster of first-timers, headed by the Yankees’ Bernie Williams. Between now and the time the 2013 results are revealed, there will be plenty of discussion about the merits of the players who will make their debut on the Hall of Fame ballot in 2013, and plenty of time to dissect what kind of message the electorate will send. Barry Bonds, OF, Pirates-Giants Key credentials:Seven-time National League MVP, 13-time All-Star, 762 HR (1st all-time), 1,996 RBIs (4th), 1.051 OPS (4th), 2,558 walks (1st), 2,227 runs (3rd), single-season HR record (73, 2001), eight Gold Gloves, 12 Silver Sluggers, seven postseason appearances (one league title). By any measure, it’s an amazing array of numbers and honors, hard to top in any era. And, to think, there was a time when he’d already made it clear that he was on his way to Cooperstown, but some thought his surly attitude with the media at times would cost him some votes. When Bonds is up for election in the Hall of Fame, it’s likely his appeal of one count of obstruction of justice stemming from his April trial in federal court still will be ongoing. Bonds was convicted of that one count but a jury couldn’t come to a conclusion on three charges of giving false statements during his 2003 testimony to the grand jury investigating the Bay Area Laboratory Co-Operative (BALCO). With a sentence of two years’ probation, 30 days of home confinement and 250 hours of community service being suspended while the appeal takes its course, Bonds will be on the Hall of Fame ballot with a lot of off-the-field considerations for voters — and that amazing collection of otherwise first-ballot accomplishments. Roger Clemens, RHP, Red Sox-Blue Jays-Yankees-Astros Key credentials:Seven-time Cy Young Award winner (6 AL, 1 NL), 11-time All-Star, 1986 AL MVP, 354 wins (9th all-time), 4,672 strikeouts (3rd), two pitching Triple Crowns (AL, 1997, ’98), 12 postseason appearances (3 World Series, 6 league champions). This is another no-brainer altered by legal issues. By the time the Hall of Fame ballot is distributed, Clemens is expected to have stood trial in Washington, D.C. on six charges of perjury, giving false statements and obstruction of Congress based on his 2008 testimony before the House Committee on Oversight and Government Reform. After a government mistake provoked a mistrial last July, a new trial has been set for April 17. Regardless of the outcome, Clemens’ journey through the legal system — all the while denying he ever used PEDs — obviously will have an effect on his candidacy, which otherwise would be rock solid. Clemens’ 354 wins are the one shy of Greg Maddux (Class of 2014) for the most since Warren Spahn’s 363 through 1965, and his record seven Cy Youngs spanned 19 seasons. Sammy Sosa, OF, Rangers-White Sox-Cubs-Orioles Key credentials:1998 NL MVP, seven-time All-Star, 609 HR (7th all-time), three 60-HR seasons (1st), six Silver Sluggers, two postseason appearances. 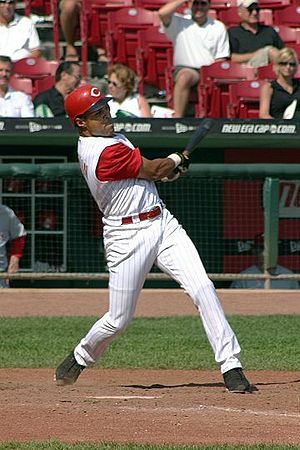 The National League MVP after he and Mark McGwire went on their historic homer tear in 1998, Sosa also has allegations of PED use in his history — along with an incident with a corked bat in 2003. 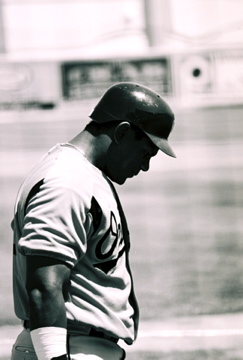 The New York Times reported in 2009 that Sosa was among the players who failed drug tests in 2003, although he denied in the 2005 Congressional hearing that he ever took steroids. If his ’98 slugging partner McGwire is any indication, it’ll be tough for Sosa to get much support. McGwire received 19.8 percent of the vote in his fifth year on the ballot a year ago. Mike Piazza, C, Dodgers-Marlins-Mets-Padres-A’s Key credentials:12-time All-Star, 1993 NL Rookie of the Year, 462 HR (most ever by a catcher), 10 Silver Sluggers, five postseason appearances (1 league champion). From the time he burst onto the scene as a 62nd-round pick who became a Rookie of the Year for the Dodgers, Piazza proved to be one of the greatest hitting catchers of all time. While he hit 30 homers in eight consecutive seasons and nine overall, his most memorable homer was a two-run shot on Sept. 21, 2001, to push the Mets to victory in their first home game after the 9/11 attacks. There were whispers throughout his career and one published allegation, but Piazza never has been directly, officially implicated in using PEDs. Craig Biggio, 2B, Astros Key credentials:Seven-time All-Star, 3,060 hits (21st all-time), 668 doubles (5th), 285 HBP (2nd), 1,844 runs (13th), four Gold Gloves, five Silver Sluggers, six postseason appearances (1 league title). A one-team man who became the 20th player to reach the 3,000-hit barrier, Biggio would seem to have the requisite credentials. Only Rafael Palmeiro, his 11-percent support reflecting his own PED issues, has 3,000 hits and hasn’t been voted into the Hall of Fame once eligible. Biggio fell just nine homers short of joining Willie Mays as the only players with 3,000 hits, 300 homers and 300 steals. By all accounts, Biggio also passes the character test and hasn’t had his name mentioned in connection with PED use. Former teammate Jeff Bagwell checked in with 41.7 percent of the vote his first time out in 2011. Curt Schilling, RHP, Orioles-Astros-Phillies-D-backs-Red Sox Key credentials:Six-time All-Star, 216 wins, three 20-win seasons, 3,116 strikeouts (15th all-time), five postseason appearances (3 World Series, 4 league champions). Schilling really made his legacy in the postseason, where he combined with Randy Johnson for the ultimate Dynamic Duo that led the Diamondbacks to the 2001 World Series title and then moved his October show to Boston, where the Red Sox won two World Series titles with Schilling as a key part of their pitching staff. Whether he did enough over the course of his entire career to warrant entry to Cooperstown is likely to be the main consideration for Schilling. Like the rest of the players who will make their debuts on the 2013 Hall of Fame ballot, the decision won’t be clear or easy to make. For the voters, it’ll be a whole different ballgame. John Schlegel is a national reporter for MLB.com. This article used information from baseball-reference.com. This story was not subject to the approval of Major League Baseball or its clubs. Bloggo’s take is that the steroids gang don’t belong in the Hall. NEW YORK — The National Baseball Hall of Fame will announce whether there is an electee joining Ron Santo in the Class of 2012 on Monday. The results of the voting by eligible members of the Baseball Writers’ Association of America will be revealed during an MLB.com simulcast of the announcement on MLB Network live at 2 p.m. ET. The vote was conducted by the BBWAA this past December. Because of the least-imposing first-year group of eligible players in recent memory, former Reds shortstop Barry Larkin seems to be the lone possibility for election. But he is no shoo-in. The 12-time National League All-Star and three-time Gold Glove Award winner, who played his entire 19-year career at home with Cincinnati, finished third in the 2011 balloting to second baseman Roberto Alomar and pitcher Bert Blyleven. The latter two were inducted into the Hall this past July 24, along with general manager Pat Gillick, a post-expansion Veterans Committee electee. 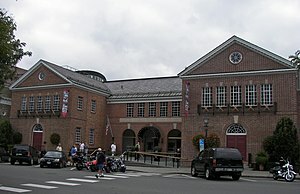 Any new electee will be inducted into the Hall during this year’s ceremonies on July 21-22 in Cooperstown, N.Y. Santo, the legendary Cubs third baseman, was elected to the Hall last month by the Golden Era Committee and will be inducted on July 22 behind the Clark Sports Center. On July 21 at Doubleday Field, Ford C. Frick Award winner Tim McCarver and J.G. Taylor Spink Award electee Bob Elliott will be honored in a separate ceremony. As in any Hall election, to ascend to the Hall, a player needs to have his name appear on 75 percent of the ballots cast. Players must amass at least 5 percent of the votes to remain on the BBWAA ballot from year to year. They have 15 years of eligibility, beginning five years after retirement. BBWAA members with at least 10 consecutive years of covering Major League Baseball could place as many as 10 names on their ballots. This past December, the Golden Era Committee of 16 members considered 10 candidates — eight players — who participated in the Major Leagues from 1947-72. Needing 12 votes to be elected, Santo — who died on Dec. 3, 2010, from complications of diabetes and cancer — received 15 of the 16 votes. Larkin, an ESPN baseball analyst, is in his third year on the BBWAA ballot. He garnered 62.1 percent — 361 of a possible 581 votes — in last year’s balloting. Based on those figures, he must jump 12.9 percent to gain election. He received 51.6 percent of the vote in 2010, his first year on the ballot. That kind of acceleration is not unheard of. In the history of the BBWAA balloting, which goes back to the first class in 1936, 16 players have made a leap of at least 13 percent in a single year to get into the Hall. The last player to make up such a sizable margin was Cubs second baseman Ryne Sandberg, who went from 61.1 percent in 2004 to 76.2 percent a year later. Coincidentally, Sandberg was elected in his third year on the ballot. Among the notable first-timers on the BBWAA ballot are Yankees center fielder Bernie Williams, Braves catcher Javy Lopez and Angels outfielder Tim Salmon. The other first-timers are Jeromy Burnitz, Vinny Castilla, Brian Jordan, Bill Mueller, Terry Mulholland, Phil Nevin, Brad Radke, Ruben Sierra, Tony Womack and Eric Young. Aside from Larkin, other prominent returnees are pitchers Jack Morris (who was fourth with 53.5 percent of the vote last year, his 12th time on the ballot) and Lee Smith and first baseman Jeff Bagwell. Morris, who won the World Series with Detroit, Minnesota and Toronto and had 254 victories during his 18-year big league career, is a long shot. He needs to pick up 21.5 percent to make it this year. That’s happened 10 times in the history of the balloting, though not since 1964, when White Sox shortstop Luke Appling gained election. But Morris has always been pretty blase about his chances. First basemen Mark McGwire and Rafael Palmeiro were also back on the ballot, but the pair’s association with the era of performance-enhancing drugs has led to a considerably low percentage of the vote. McGwire, the Cardinals hitting coach who admitted he used steroids during his playing career, got 19.1 percent of the vote last year. Palmeiro, who failed a drug test and was suspended in 2005, his last MLB season, got 11 percent of the vote last year, his first on the ballot. The other returnees are the low vote-generating Juan Gonzalez, Edgar Martinez, Don Mattingly, Fred McGriff, Dale Murphy, Tim Raines, Alan Trammell and Larry Walker. For example, last year, Mattingly, heading into his second season as Dodgers manager, garnered only 13.6 percent. After this year, the coming ballots will be more and more star-studded. What surely will be a controversial vote next year will include all-time home run leader Barry Bonds, 354-game winner Roger Clemens, 3,000-hit-club member Craig Biggio, 12-time All-Star Mike Piazza and Sammy Sosa, who slugged 609 homers. The ballot for 2014 induction will boast a trio of great pitchers in Greg Maddux, Tom Glavine and Mike Mussina, plus slugger Frank Thomas. The group for 2015 will include another great group of pitchers: No. 2 overall strikeout leader Randy Johnson, Pedro Martinez and John Smoltz, plus outfielder Gary Sheffield. And finally, the ballot for 2016 will offer outfielder Ken Griffey Jr., Yankees left-hander Andy Pettitte and closers Trevor Hoffman and Billy Wagner. Bonds and Clemens are in the midst of court cases, each charged with perjury allegedly committed during legal testimony about the use of performance-enhancing drugs. Bonds was found guilty on one count of obstruction of justice and has appealed his sentence. Clemens’ trial is set to begin anew this spring. The BBWAA has been consistent in electing at least one player each year, but only eight times in history has it elected three players or more. The last time the writers did not elect anyone was 1996, when pitcher Jim Bunning and manager Earl Weaver were among a quartet elected by a Veterans Committee. Larkin remains the primary hope, and this would seem to be his best shot at it for a while. He is a nine-time Silver Slugger Award winner, a member of a Reds squad that swept the A’s in the 1990 World Series and the National League’s Most Valuable Player in 1995. His .295 lifetime batting average is 33 points higher than that of Cardinals shortstop Ozzie Smith, who was elected predominately for his defense in 2002. Cal Ripken Jr., elected along with Padres right fielder Tony Gwynn on the first ballot for both men in 2007, hit .277 as a shortstop, the position he played for most of his stellar 21-year career with the Orioles. But Larkin said he isn’t taking anything for granted. “I spent some time with Jim Rice when he was elected [in 2009] in his 15th year,” Larkin said. “And I asked him why he thought it took him so long to be elected. He said, ‘You can’t go out and do anything else in your career. You have to feel good about what you were able to do.’ Nothing had changed. That gave me a good perspective. So I’ve got to roll with the punches, at this point. Barry M. Bloom is national reporter for MLB.com and writes an MLBlog, Boomskie on Baseball. Follow @boomskie on Twitter This story was not subject to the approval of Major League Baseball or its clubs.